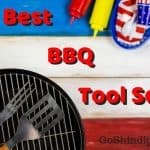 If you are looking for the best small BBQ grills, then our buyer’s guide is the place to start your search. Whether you prefer to grill on your patio or in your yard, small BBQ grills come with features and extras to meet any grill master’s needs. You can find a small BBQ grill to fit any budget and cooking style. They can operate using gas or charcoal, and a few even work using electricity. However you prefer to fuel your fire, you can find the perfect grill to feed your family and friends for years to come. Gas BBQ grills are one of the most popular types, and it’s easy to see why. Most gas grills use an exterior propane tank for fuel, but you can convert some to run on natural gas by using a conversion kit. Just turn the gas on and the fire will light right up! You can get grilling in a few minutes without the hassle of managing charcoal, and they produce less smoke to foul the air. If you have spent much time on this site, then you know I am a big Weber fan! This small grill is a great example of the quality you will find in a Weber product. The Genesis grill features two stainless steel burners that produce 26,000 BTU per hour, and a redesigned grease trap with an open cabinet that makes dealing with the drippings a breeze. The two stainless steel prep surfaces have hooks so your grill tools are always in reach, and the left side table folds down for easy storage. The twin enameled cast iron cooking racks provide 380 square inches of cooking space. The warming rack gives you another 114 inches of space, and even tucks away when you don’t need it! The overall design of the GS4 grilling system makes it a dream to use. 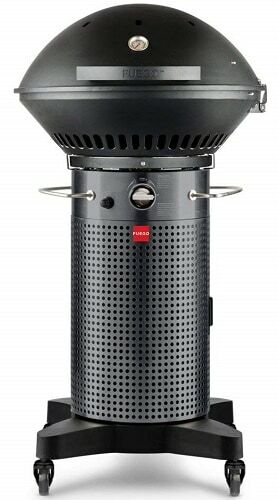 Weber guarantees the ignition will light every time and backs it with a generous warranty. Weber Genesis grills look great in your yard on on a porch, and the open cabinet means it is easy to move around. Grill on the porch one day, and then in the yard the next; this powerful little grill will have you cooking outdoors year round. One great thing about Weber grills are their warranties. The overall exterior has a 10 year warranty and many of the internal parts have a 5 year guarantee against rusting or burn through. Weber customer service is also top notch, so if you have a problem they will do everything they can to help you solve it. This grill can run off of a liquid propane tank, or you can tie it into your home’s main natural gas line. 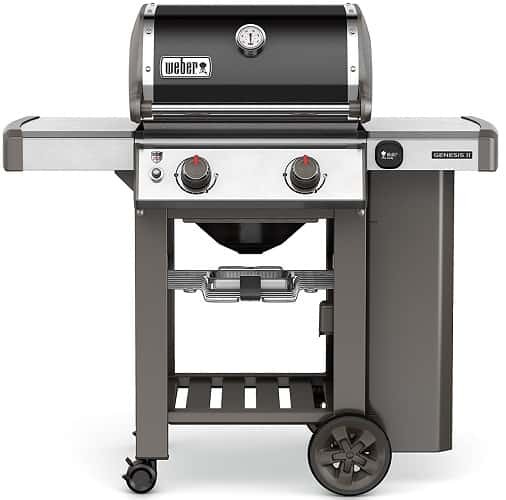 If you prefer a closed cabinet or pedestal-style small grill, then the Weber Spirit is a great option to consider. While basic in design, this sleek, modern looking grill is a workhorse with a solid reputation. It has two stainless steel burners that provide a powerful 26,500 BTU per hour. The enameled cast iron cooking grates are pre seasoned and ready to use out of the box. The Genesis features 360 square inches of cooking space directly on the grill. It also has a warming rack that offers another 90 square inches, for a total of 450 square inches of space! It comes with two stainless steel prep tables that fold down when not in use. The tables have hooks for hanging your grilling tools, and the cabinet holds your propane tank and makes accessing your grease trap super easy. This grill comes with Weber’s great 10 year warranty, and the internal parts are also covered for 5 years against rusting or burn through. The Spirit can operate off of an external propane tank, or you can tie into your home’s natural gas line by using a conversion kit. If you are looking for something a little different, then check out the Fuego Professional propane grill. It is a compact pedestal-style grill with some modern twists and has been recently redesigned, so it is even more user friendly. It features two powerful stainless steel burners that produce 26,500 BTU per hour, and it preheats to 500 degrees F in just a few minutes. The specially designed hinged lid is offset so you never have to reach over the fire to use it, and the rounded lid gives you room for direct and indirect grilling. The Fuego’s space saving design does not stint on the cooking surface; you have a full 415 square inches of primary cooking area with an additional 110 inches on the removable warming rack. The round shape of the cooking rack means no awkward corners to navigate, and it is a roomy 24 inches in diameter. This compact grill is especially suited for cooking in small spaces like an apartment porch or small patio, and the wheels and casters make moving it around easy. It weighs a light 80 pounds, so you won’t have to struggle to get it out for grilling! 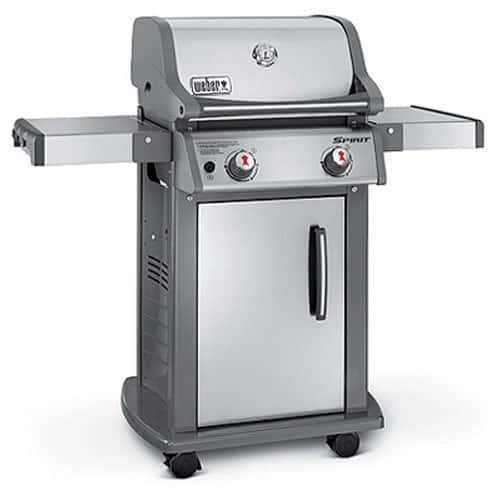 The warranty covers the entire grill for 1 year, and the stainless steel burners for 3 years. 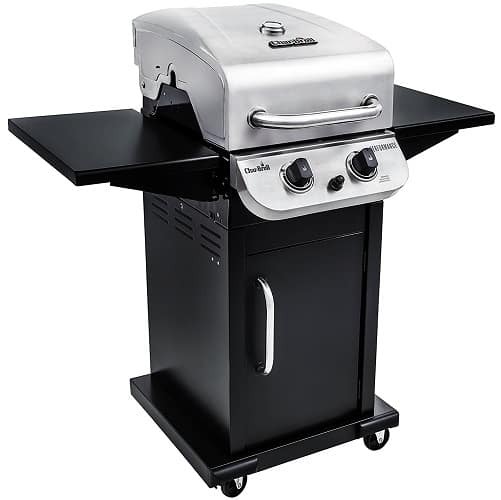 There are many accessories you can buy for this grill, including attachable side work tables. The Fuego comes ready for use with a propane tank, which you can store in the pedestal base. You can buy a conversion kit from the manufacturer which will allow you to hook it into your natural gas line. 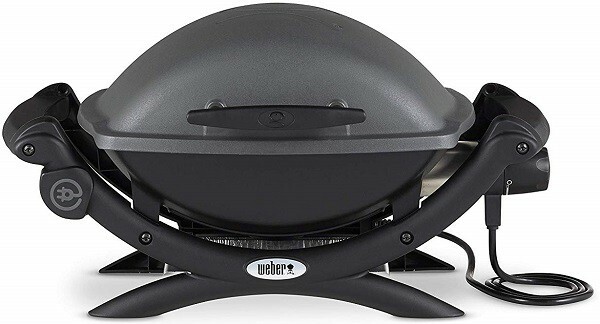 If you are looking to cook on the go, then this Weber portable grill is a solid pick. All the great performance of a Weber propane grill in a tabletop package! The redesigned Q1200 features a single stainless steel burner that produces 8,500 BTU per hour. The easy start ignition and infinite burner control valve make this a snap to start and adjust your flames. It has 189 square inches of cooking surface, and the split cooking racks are easy to clean and are interchangeable with the Weber griddle insert. This grill is lightweight at 29 pounds and is made from sturdy cast aluminum. The two small side tables fold up for portability, and it has a large handle to make carrying it easy. You can use this tabletop grill for tailgating, picnics and at the beach, or you can get the Weber portable cart for grilling in your yard or on a patio. Using a heat resistant tile or mat, you can use this grill pretty much anywhere you choose, on the ground or even on a foldable card table. The Q1200 is perfect for use with small disposable 14 or 16 ounce propane tanks, but you can convert it to run off a larger refillable propane tank. It comes with Weber’s 10 year warranty. Another pedestal style compact grill, the Char Broil 300 is a sleek basic grill with some nice bonus features. The stainless steel lid looks sharp and will take a beating, and the painted cabinet and base are sturdy and durable. The two stainless steel burners produce 24,000 BTU per hour, and provide 300 square inches of cooking area. The swing away warming rack gives you another 100 inches, and is made from enameled cast iron for additional longevity. The two attached metal side tables fold down when not in use, and the pedestal cabinet hides your propane tank out of sight, and has room to store your accessories. The grease tray is porcelain coated for durability and is easy to slide in and out. This grill is lightweight, weighing about 80 pounds, and has 4 large caster wheels for increased mobility and stability. The rear casters are lockable, so your grill won’t move until you are ready. The limited manufacturer’s warranty is good for 5 years on the stainless steel burners and 2 years on the firebox and lid. The other parts have a 1 year warranty. The Char Broil works with liquid propane, and you can’t convert it to run off of your natural gas line. Most pitmasters agree that true BBQ flavor can only be achieved by grilling on a charcoal grill. Small charcoal BBQ grills are an easy way to produce a flavorful meal for both beginning and experienced grill cooks. With a little practice, you can get the best BBQ flavor and even set up zones for direct and indirect cooking on a small grill! While there are hundreds of charcoal grills on the market, I definitely recommend these two classics if you are looking for a small grill. Time and again, the Weber Master Touch is my go-to choice for a small kettle grill. While you can read my full review here, let me tell you, this grill does not disappoint! Based on the original Weber kettle grill, this updated version is easier to use than ever. The 22 inch diameter hinged enameled cooking rack provides 363 square inches of cooking space and fits most Weber rack accessories. The sturdy lid and bowl are also enameled for extra durability, and there is a convenient slot to hold the lid so you don’t have to put it on a table or on the ground when it’s not in use. The one-touch cleaning system is made from aluminized stainless steel and makes it easy to empty after you use it. 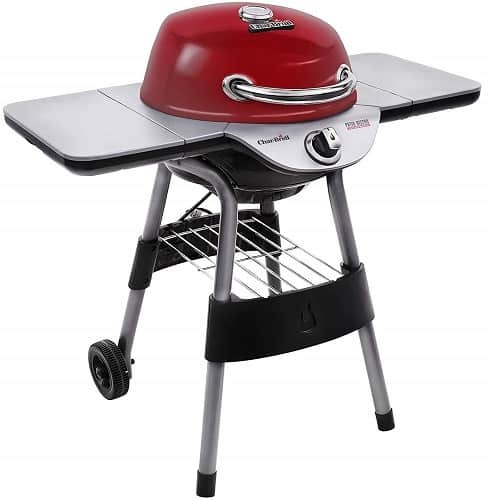 This grill has a solid tripodal base with two wheels, so it is stable and simple to relocate. It has dampers for improved heat control and a built-in heat shield on the lid handle to protect your hand. The Master Touch is a grill you will use for years, and is suitable for use with many of Weber’s grill accessories. You can easily arrange the coals into cooking zones and even use a smoker box or kettle rotisserie with it! Backed by Weber’s superior 10 year warranty, you won’t be shopping for a new charcoal grill anytime soon! The aptly-named Go-Anywhere is great option if you are looking for a tabletop charcoal grill. The design is perfect for camping and tailgating, and it has some unique features that really make it stand out. The foldable legs allow you to use this grill on a table or on the ground (with a protective heat tile or mat), and they also double as a secure lock for the lid. You can carry it easily in one hand, since it weighs only 14 pounds. The sturdy one piece design has no bolts or screws to get in the way, and the porcelain enameled exterior will resist rusting and weathering for many years. The generous cooking surface gives you 160 square inches of space to grill on. I especially like the built-in lid hangers, which allow you to prop up the lid as a shield against the wind. It has two dampers and several vent holes for heat control. For the price, you really can’t get a better small charcoal grill that can used anywhere you need it. It comes fully assembled and ready to fire up! The warranty covers the exterior and firebox for 10 years, and some of the internal parts for 5 years. Suitable Weber accessories and replacement parts are easy to find. Electric grills are not for everyone, but they are a growing part of the market and have their fans. One advantage to using an electric grill is the lack of smoke. Unlike a charcoal grill, an electric grill does not add to air pollution, and they tend to preheat quickly. Of course, a downside to electric is that you need to be close to an electrical outlet. Still, for folks living in apartments or in the middle of cities, an electric grill might be the best option! This tabletop Weber is the electric version of the Q1200 I reviewed above, and has many of the same features. Recently redesigned, this grill is perfect for patio grilling and is easy to bring with you. The 1560 watt electrical element works to heat the 189 square inch enameled cooking rack. The cast aluminum lid and body are lightweight but sturdy, and retain the heat well. The one touch start button and infinite control valve make lighting the grill and heat control pretty simple. The large grip handle and sturdy side handles ensure that carrying it around is no problem. You can use this grill on a table or floor (with a heat resistant tile or mat), or you can use the Weber Q portable cart. Either way, this little electric grill is a workhorse that will keep you in steaks and sausages for a long time to come. 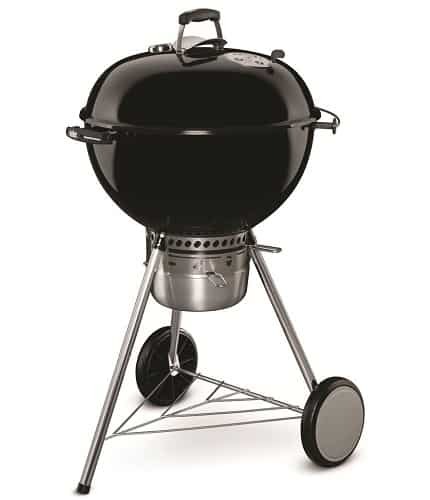 It comes with the great Weber 10 year warranty, with some internal parts covered for 5 years. Once you go Weber, it is hard to accept anything less! This is a great compromise for folks who want a classic kettle grill in an electric unit. Using an infrared heating element for cooking, the Char Broil is able to produce some darn good BBQ! The lid and body are made from sturdy porcelain coated steel, and the cooking rack is enameled cast iron that is easy to clean and maintain. The two built-in side tables give you workspace and fold for easy storage. This grill has 240 square inches of cooking space with a rear warming rack that provides an additional 90 inches. The infrared element produces 1750 watts and the cord works with a standard 120 volt GFI outlet. The cart is well designed and stable and features a storage rack, a cord management system and two wheels to make it easy to move. It also has a large, easy to reach grease tray. This grill does not hold heat as well as a gas or charcoal unit, so you will want to avoid peeking as much as possible while cooking, especially in colder weather. The electrical cord is 59 inches long, so you may need an appropriate extension cord to use it on your patio. The Char Broil comes with a 1 year warranty on the electrical parts, and a 2 year warranty on the lid and fire box. Nothing says BBQ like some smoked meat! 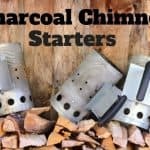 Flavored with the delicious aroma of wood smoke, you will never want to go back to other techniques once you try real meat smoking, and these small units are a great place to start playing! 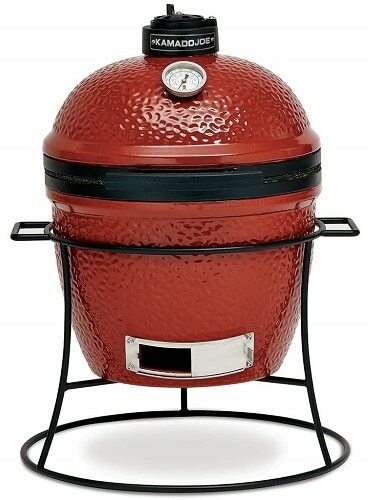 Probably the most well known name in smokers, the Kamado Joe Jr is a smaller version of the full sized Kamodo Joe that has gained such fame in the meat smoking world. It is a small portable smoker perfect for camping and tailgating parties, or for use on your porch. Featuring a solid bullet shaped chamber on an elevated stand, the Kamodo Jr is made from a thick ceramic that will hold in heat and moisture. You can use it to roast, grill or smoke foods over charcoal and wood. The 13.5 inch diameter stainless steel cooking rack provides 148.5 square inches of cooking space. 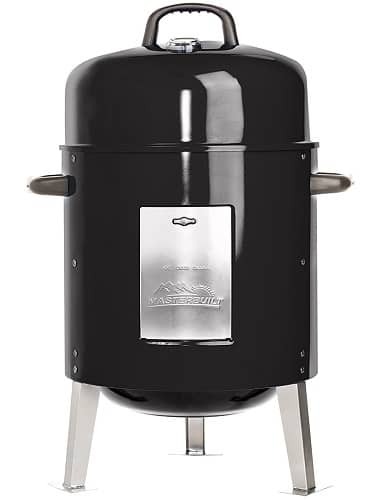 This smoker can provide a steady cooking temperature from 225-750 degrees F! The Joe Jr is a hefty 68 pounds, so it is portable with assistance. If you have the room on your balcony and want additional cooking capacity, you might consider upgrading to the Kamodo Joe Classic II. You can read my best kamado smoker guide here. The Kamodo Joe Jr is a great investment if you love to smoke meat low and slow for that classic BBQ flavor. While it doesn’t have a lot of fancy features, this solid bullet smoker does its job very well and produces unbeatable smoked meats. The Kamodo comes with a fantastic warranty! The warranty covers the ceramic parts for their lifetime against failure (but not accidental breakage), and protects the metal parts for 5 years. It may be a more expensive smoker than many on the market, but their warranty protects your investment. This inexpensive bullet smoker is a nice place to start for beginning meat smokers and offers enough flexibility for more experienced ones. It is a basic charcoal unit with some well designed features. The interior of the bullet holds two enameled cooking racks that provide 395.4 square inches of cooking space. The charcoal pan and water tray are also porcelain coated for durability. The smoker comes with an access door for adding more charcoal or wood to the fire, so you won’t have to unload it to adjust your fuel. There are dampers to control the heat, but many people modify theirs further by drilling extra holes. While you can’t call a portable smoker, it only weighs 16 pounds, so it would be pretty easy to take it with you on a trip. The conveniently located handles on the side of the smoker will make moving it a simple chore. This smoker is a good size to house on a porch, standing just shy of 3 feet tall, although you will want to protect it with a cover when not in use. Masterbuilt covers this smoker under warranty for 90 days. Given that this is an entry level smoker, it is probably not worth the cost of buying an extended warranty. 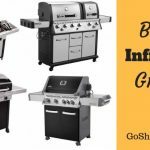 When shopping for a small BBQ grill, it is best to start by defining your budget range, and then sort through which features you really want and which you can live without. The good news is that you can get a great grill on a reasonable budget! 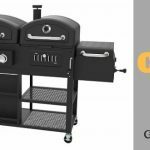 The best small BBQ grills featured in this article range in cost from around $50 to several hundred dollars. Tabletop grills tend to be less expensive, and as you add in stands, higher quality materials and extra features the price goes up. Also keep in mind that most grills do not come with fuel or a cover, so you will have additional expenses as you kit out your new toy! The next consideration when looking for the perfect small BBQ grill is determining the size you need. You should consider how you plan to use the grill, and where you will use and store it. There are a few components to the size issue. Obviously there is the overall dimensions of the grill, both when prepped for storage and when fully ready to use. You don’t want to discover later that your grill is too big to use on your patio! Then there is the cooking capacity question, and what you plan to cook on your new grill. Small grills are most suitable for making meals for 1 to 4 people, depending on the size of the cooking grate. A tabletop model will be able to hold about half the food that a larger small BBQ grill can handle. If you like to cook large cuts of meat like whole chickens and racks of ribs, you might be happier with a bigger grill. Get the biggest grill you can that has the features you want the most. This can be tricky to judge from the product descriptions, but the reviews will usually give you some insight into the overall quality of the materials of your grill. If you can, check them out in person to get a feel for the quality first hand. A well designed and constructed grill will last longer, and stand up to the abuse of heat and weather better. Less expensive materials, like thinner metal and cheaper screws and bolts, can deform and wear out faster than higher quality materials, and may be more difficult to put together. Look for units that have porcelain enameled lids, fireboxes and cooking grates as an indication of their overall quality. Also, check out the product warranty, and see what replacement parts are available for the grill of your choice. Eventually every grill will wear out. Even a cheaply built grill can last for years if you protect it, maintain it and keep it covered when not in use. A grill cover is a must if you store yours outside! Ahhh, the Classic BBQ battle! While many folks state that “real” BBQ comes from cooking over charcoal and wood, these grills are not everyone’s tankard of beer. Pick the fuel source that best matches your interests, cooking style and living space. Charcoal grills are the most common, and tend to be less expensive than gas or electric grills. Using a charcoal grill you will get the true feel of BBQing, playing with hot coals and creating cooking zones. But you also have to deal with lighting the coals and storing the hot ash for safe disposal. Gas grills are a very popular subdivision due to their ease of use. You won’t get the exact same flavor as a charcoal grill, but you can use a smoker box to replicate it if you wish. Gas grills most often run off of a tank of liquid propane that you can have refilled locally, although you can convert some to run off your home’s natural gas line. Electric grills are a newer option, and many produce results as good as any gas grill. They use an electric element to produce the heat needed to cook your food. Lower priced electric grills often suffer from a heat problem, as the thin walls of the cook box rarely contain the heat as well as a higher quality grill. For tabletop grills, this won’t matter as much, but for larger electric grills you might want one with more power to compensate. Another downside to electric grills is that you need to plug them in to a grounded outlet, and many patios and porches might not have them handy. In that case, you will need a special extension cord that can handle the wattage of your grill. This one will depend on the size and portability of the grill you desire. If you plan to take your grill camping or tailgating, then a tabletop style grill may be your design of choice. Some tabletops models, like the Weber Q1200 and Q1400, have an optional stand you can pick up separately for use at home. Many grills come with a build-in stand that holds the firebox and lid at a comfortable height. They often have storage or shelves built into the stand, and have wheels so relocating them is easier. More expensive grills will have higher quality caster wheels with integrated locks so they stay in place. As someone who has had a grill roll off a porch in a windstorm, let me tell you that locking wheels are very helpful! Some grills have a pedestal style stand, and many of these contain an enclosed cabinet that can hold supplies, grill tools or a propane tank. Others may have an open shelf with access to the ash collector or drip trays. In terms of design, you have a lot of options, so pick the style you like best and that matches your grilling style. This use to be a feature only found on the most expensive grills, but happily you can now find them on grills at all price points! Having an attached side table or workspace on your grill is a very useful feature. Sure, you can pull up a card table in a pinch, but for the day-in and day-out grilling you will be very happy to have a place to set down your tongs or plate. Often these shelves will fold down or back against the grill when not in use. This makes their footprint smaller and makes them easier to store. I’m a big fan of these shelves, I’ll be honest. At the least, they give me a place to set down my beer where the dogs can’t reach. If you grill frequently you will really appreciate this feature! Accessories are another way to put your personal stamp on your grill. The options will vary depending on the grill you buy, but common extras include griddle pans that fit in place of your cooking grates, smoker boxes for adding wood smoke flavor to your foods, rotisserie options and grill lights that attach to the handle of your grill and light up your cooking at night. One reason I am such a fan of Weber products is that they have many well designed accessories that precisely fit their grills. When you get a Weber grill you know you have a lot of options for expanding its use. Before you settle on a grill, check out the accessories available for your model of choice. Even if you don’t get them right away, you may see something you want to grab down the line. It’s always good to know your options before you fork out your hard earned cash. I hope you have enjoyed this tour of the Best Small BBQ grills! These grills are a great option for smaller families, and are suitable for new and experienced cooks alike. You can find grills at a range of prices and with any feature you could want, from side tables to warming racks. They are available for all types of fuel, and include tabletop and stand alone models. Small grills can do everything from grilling hamburgers to smoking cuts of meat. The sky’s the limit. So what are you waiting for? Get grilling!